Over the course of the 2016 Presidential election, Americans became very familiar with the resurgence of an old “ism”: populism. Elites attempted to revive the word as an accusation, one they hurled at Donald Trump and his supporters as on “the wrong side of history.” The elites were chagrined when “populist” movements started appearing in other countries, such as the United Kingdom, Italy, and even Germany. Yet what exactly “populism” is remains somewhat nebulous today, although what we are witnessing in both America and in Europe walks and quacks like populism. It must be populism—which is what, exactly? The New Criterion’s Roger Kimball has compiled a series of essays from conservative scholars and commentators to address the varieties of populisms from different perspectives. They examine populism from the central conservative principle of supporting a political order that allows its citizens to thrive virtuously in a free society, with an ordered liberty and diffused power. The populist uprising, Kimball writes, may be largely influenced by a passion for freedom in the wake of an increasingly totalitarian state, and “obtaining a fuller, more historically informed understanding of that passion” is the goal of this collection. Historian of conservatism George H. Nash contextualizes a “Trumpist” populism within the framework of twentieth- and twenty-first-century conservatism. His discussion of Trump’s adversarial impulses toward the political and cultural ruling classes echoes those of the conservative establishment who felt politically orphaned by their party throughout the election and over a year into the Trump presidency. The “contest between Trumpism and its conservative critics has become not just a dispute over economics and details of public policy but a conflict of visions not easily papered over by pragmatic compromise.” Barry Strauss’s essay takes a slightly different tack. Although acknowledging with Nash the clash between Trumpist outsiders and the establishment, he reminds us that populist insurgencies have their dangers. Strauss notes that in ancient Rome, populism was the death knell of the republic. Framed as a possible harbinger of modern society under populist influence, Strauss parallels the disenchanted American working class and their elitist, establishment overlords to the Roman senators who deprived Roman soldiers of reward and property for their sacrifice once they returned from war. Rather than considering the grievances of the population, the Roman elite killed the tribunes that would voice the issue. The civil wars that eventually ensued gutted Rome of their republic and the soldiers regained the property at this hefty price. Strauss’s reference to populism-gone-wrong in 133 B.C. repeats throughout history in similar, blood-drenched fashions, most notably the unprecedented gore of Maximilien Robespierre’s Reign of Terror wreaked on France during the revolution: “the people is sublime, but individuals are weak.” This populist cri de coeur would spell a fate for the French similar to that of the Romans—with a country in shambles. 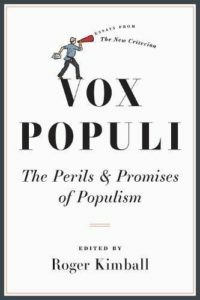 History’s account of populism certainly is not flattering, but to the benefit of Americans, robust institutions may protect from populist insurgencies reaching such catastrophic extremes, while still allowing populism to balance centralized power. Despite the perils of populism and its incompatibility with conservatism that some of the essays within the reader delineate, Sir Roger Scruton, Conrad Black, and Victor Davis Hanson explain that maybe the promises populism makes are, at the very least, understandably alluring and even temporarily necessary. One populist tactic that proved effective for the UK’s Brexiteers and Trump was the evocation of nostalgia, where reminders of a past with secure jobs and national security offered renewal in the present. Authenticity and the gumption to admit that there were flaws in need of fixing—such as insecure borders—appealed to millions of Americans, no matter in what crude manner these issues were articulated. These factors, Hanson argues, makes Trumpist populism understandable—and as Black puts it, the only route to national renovation. Perhaps the ending note of Black’s essay is one best kept in mind when considering populism as it continues to circulate as another buzzword: the United States is one of few places that can withstand an exercise in populism. The Founders had the foresight to predict the characters and sentiments that would arise in a representative democracy and, thankfully, provided for the separation of powers and limited governmental power as devices to prevent tyranny. There’s been a lot of talk about nostalgia, but this may be the retrospective message most worth remembering. Marlo Safi is a Collegiate Network journalism fellow at National Review. She can be found on Twitter @marlo_safi.